There are few things more fun than playing "pretend" as a kid. And this could mean pretty much any childhood game. Whether it's a riveting game of the floor is lava or pretending like you're a member of the X-Men on the school playground, just being able to act things out with other children is pretty darn magical. But playing pretend really got taken to another level once dressing up was involved. Sure, you could rock an air-lightsaber with the best of them, but once you held that toy in your hand, it became real. It got even better once your parents became involved, helping you come up with the perfect outfit and accessories to make your dressing up that much more comprehensive. Which is why this mom is getting so much love after what she did for her son. 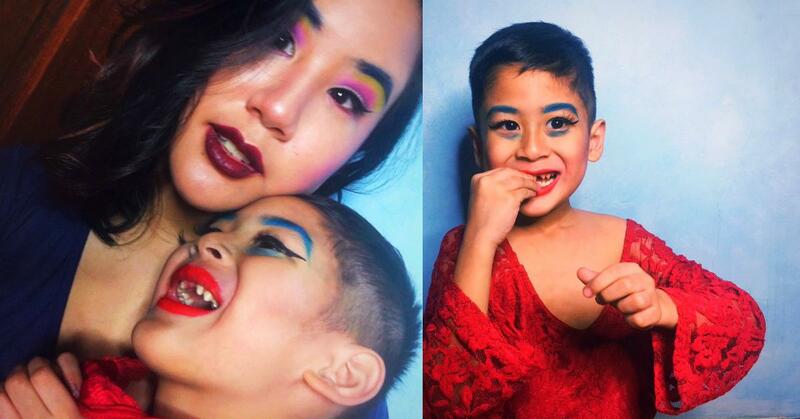 Twitter user Mikli Feria Jorge was watching RuPaul's Drag Race with her kid when he turned to her and said that he wanted to dress like they did on the show. So she obliged, getting out her kits of makeup and helping her young man look as fabulous as possible. And he ended up looking pretty darn amazing. His excitement was so infectious that even Jorge wanted to get glammed up, as well. He even came up with drag names for him and his mom. He's Balooni Liteg (the "e" and "g" are silent) and she's Cat Astrfi. Amazing use of a pun, I know. People were floored by Jorge's response and her willingness to disregard traditional gender norms. They gushed over how supportive of a reaction she had towards her son. Some people, however, weren't so supportive. Going so far as to say that his mother was "destroying" his life. Which other users saw as flawed logic. Destroying it? She's teaching him to accept both himself and others if they want to do something that society wouldn't consider "normal"
2) what's wrong with shemales, hmm? LGBTQ+ phobic much? 3) he just wanted to put colors on. Whatever your beliefs, it's hard to deny that the two of them looked like they had a bunch of fun.